Paul Weamer, was born in Altoona, PA and taught by his father to tie flies and fish in Central PA's fertile limestone valleys. Paul's entry into the fly fishing business was in 1998 when he began managing a fly fishing lodge and shop along the Upper Delaware River. He eventually left that position to become the managing partner of the Border Water Outfitters in Hancock, NY. In early 2007, after spending nearly a decade in the Delaware River Watershed, Paul returned to Central Pennsylvania as the manager of TCO State College. Paul Weamer has spent over decade fishing the Upper Delaware River watershed where the trout are large, wild, and highly selective. Be sure to listen in to find out about this great fishery and the special techniques used to hook up with the trophies. 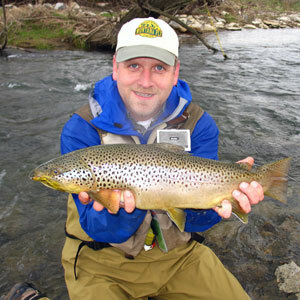 Paul is a former trout and steelhead guide and a production fly tier. His flies have been featured in the Pennsylvania Outdoors Television series, the Catskill Fly fishing Museum, and Charles Meck's landmark book The Hatches Made Simple. Paul is a contracted fly designer for Montana Fly Company and the inventor of the Weamer's Streamer and Truform fly series. Paul is a pro-staff member of Regal Engineering, Hobie Optics, and Daiichi Hooks where he designed the Daiichi #1230 Weamer's Truform (tm) Mayfly hook. Paul is a regular contributor to Fly Fisherman magazine, and a former fly fishing columnist for the Hancock Herald newspaper. He has been featured in numerous books and magazines and the New York Times. Paul's first book, Fly Fishing Guide to the Upper Delaware River, is proving to be a must have for anyone fishing the Delaware. This year Paul's two newest books have been released. The first (co-authored with Charles Meck) is the Pocket Guide to Pennsylvania Hatches. The second book, Tying Dry Flies, is also a collaboration with Jay Nichols, Charlie Craven, and Mike Heck. Paul, his wife Ruthann, and their German Shorthair, "Grizzly" Hackle, reside along Penn's Creek in Coburn, PA.
To learn more about Paul Weamer and his fly shop visit www.tcoflyfishing.com/.